My main interest here is in the family of expressions that includes active shooter and armed gunman, but as usual my attention will wander far afield. Active killer or active shooter names the perpetrator of a type of mass murder marked by rapidity, scale, randomness, and often suicide. The United States Department of Homeland Security defines the active shooter as “an individual actively engaged in killing or attempting to kill people in a confined and populated area [using firearms]; in most cases, … there is no pattern or method to their selection of victims.” Most incidents occur at locations in which the killers find little impediment in pressing their attack. Locations are generally described as soft targets, that is, they carry limited security measures to protect members of the public. The locations are places whose functions are best served by easy access for participants: for instance, restaurants (especially fast-food restaurants), bars and nightclubs, music festivals, schools, colleges, churches, and large business offices. Armed gunman goes back to before 1920, with erratic occurrence, then takes off dramatically around 1970. In contrast, active shooter is scarcely attested at all until around 1990, when it too shoots up dramatically and overtakes armed gunman. Armed gunman. Yes, it’s pleonastic, and that annoys lots of people, who point out sharply that armed man or gunman would do as well. This is worth disputing. One natural reading of armed gunman is ‘man armed with a gun’, which alows for a contrast between such a man and other armed men, in particular those armed with knives or other weapons. In many contexts, this difference isn’t important, but in some it is. Or it could take in more than a particular context and refer to habitual action, generalized inclination, or even occupation, as in He’s a syndicate gunman, meaning that he’s prepared to use a gun in committing criminal acts on behalf of the syndicate. In either case, gunman isn’t a simple equivalent of armed man. A man armed with a high-powered rifle was shot by police after a tense standoff in an Oakland neighborhood, reports CBS San Francisco. The armed gunman of the headline turns out to have been an active shooter. Not an isolated example. Shooters. It turns out that this is not a Stanford product, but a YouTube video from, oh my, the University of Texas at Austin. The juxtaposition of gun and Texas led me immediately to two powerfully distressing memories: to Lee Harvey Oswald assassinating John F. Kennedy in Dallas in 1963, and to Charles Whitman spraying bullets from the tower at the University of Texas, Austin, in 1966. No surprise that I vividly recall the first, but the second has stuck with me over 50 years, a name and year and scene that I don’t have to look up; it will probably be with me until my last bits of memory evaporate. On August 1, 1966, after stabbing his mother and his wife to death, Charles Whitman, a former Marine sharpshooter, took rifles and other weapons to the observation deck atop the Main Building tower at the University of Texas at Austin, then opened fire on persons indiscriminately on the surrounding campus and streets. Over the next 90 minutes he shot and killed 14 people (including one unborn child) and injured 31 others; while a final victim died in 2001 from the lingering effects of his wounds. The incident ended when police reached Whitman and shot him dead. As of February 2018, the attack is ranked as the eighth-deadliest mass shooting in U.S. history. Mass shootings in this century have their years boldfaced: 7 of the 10. Mass shootings are freakishly rare — very much rarer than serial killings — but they’ve been increasing in frequency. Since they occur in “places whose functions are best served by easy access for participants” (above) and since they are so rare, they are especially terrifying. 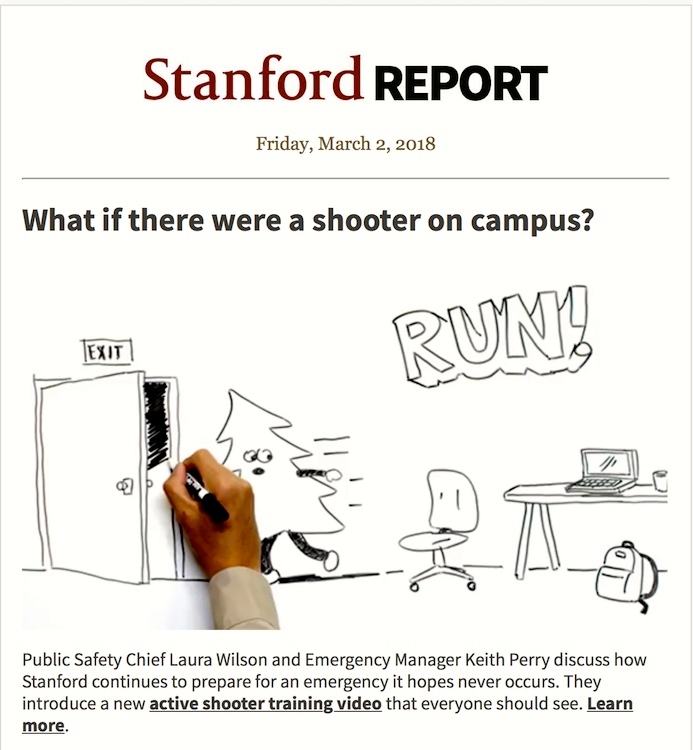 The UT Austin video offers advice about what to do if you’re threatened by an active shooter, but I’m deeply dubious. Nobody has a clue as to whether the advice to run, hide, fight, however commonsensical it sounds, would actually reduce the number of deaths, nor could we test the idea. Meanwhile, proposals abound to both insulate and weaponize some soft targets, schools (of various kinds) in particular, thanks to mass shooting #9 in the list above. Keep guys — it’s all guys — with weapons out of the schools, and provide bullet-proof spaces in classrooms for students and teachers to take shelter in. Hire security and arm staff, to counter guns with guns. I find these proposals mostly alarming (for reasons well rehearsed in the media), but also extraordinarily expensive, especially for elementary and secondary schools, which are habitually short of money for building maintenance and classroom supplies, not to mention teacher salaries. But we will surely be told that we can’t afford not to spend the money. And of course there cannot be serious legal restrictions on gun use, since SCOTUS has now determined that gun ownership is not merely an opportunity afforded by US law (like car ownership), but a right guaranteed by our Constitution. This entry was posted on March 24, 2018 at 10:59 am and is filed under Language and the law, Pleonasm. You can follow any responses to this entry through the RSS 2.0 feed. You can leave a response, or trackback from your own site.